In the past couple of years, the term “cloud services” has become very fashionable. Every company wants to be on it. So, even if your day-to-day job is not virtualization, it still makes sense to know about it. Now, even though a cloud service is just a platform outside your own private environment, to someone who hasn’t worked with it, the concept seems alien. There is also a mental hurdle in going to a cloud service provider and entering your financial details, even to get free resources for a period. 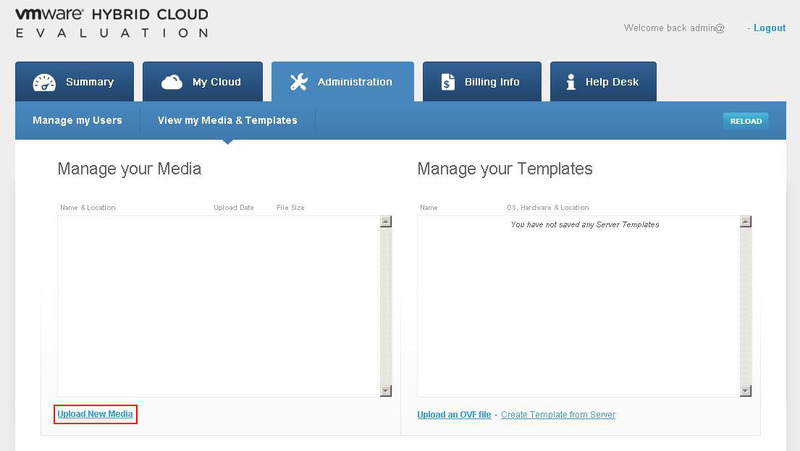 The first step is to go to the “Evaluate vCloud” page and click on the “Free Trial” button. 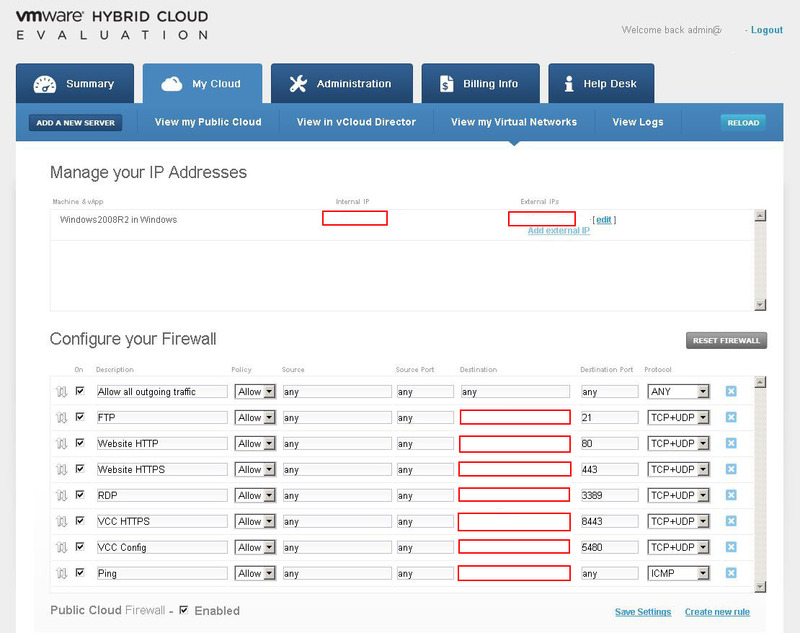 It takes you to the “VMware Hybrid Cloud Evaluation” page, where you need to provide your Name, Company Name, Business Email and Phone number. You also need to read and accept the terms and conditions. That’s where the fun begins. I would recommend using Firefox with this as I’ve found it to be more responsive but Internet Explorer is also a good choice. Chrome users will be a bit disappointed as the vCloud Director environment won’t work with it. 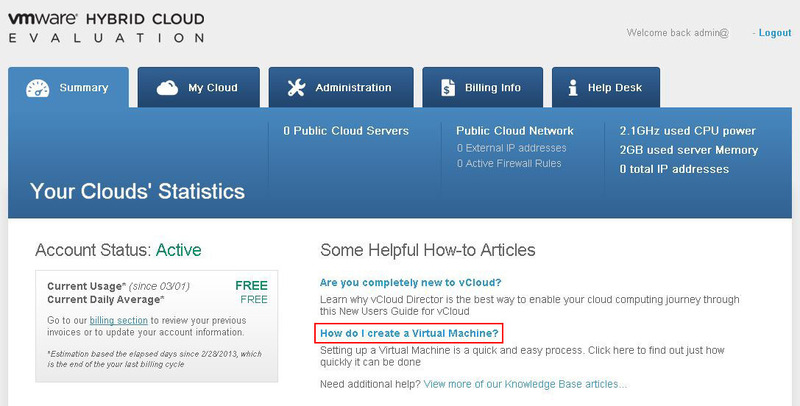 Notice the “How do I create a Virtual Machine?” link. Click that for an excellent introduction to the process. The process lets you create machines using pre-built templates i.e. you don’t even need the media and the machines are ready in a few minutes. As long as you remain within the resource limits and have no more than two machines, it’s all free for 90 days! You can also install “Applications” e.g. 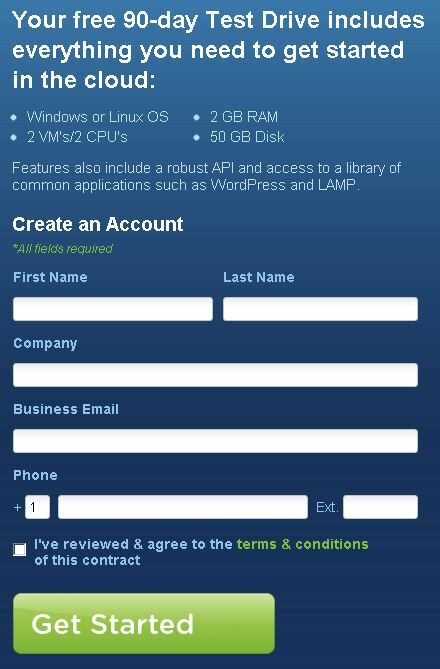 a WordPress Server. Of course, you can’t see the password here as I’ve erased it :-). It should be where I’ve indicated in the picture above. 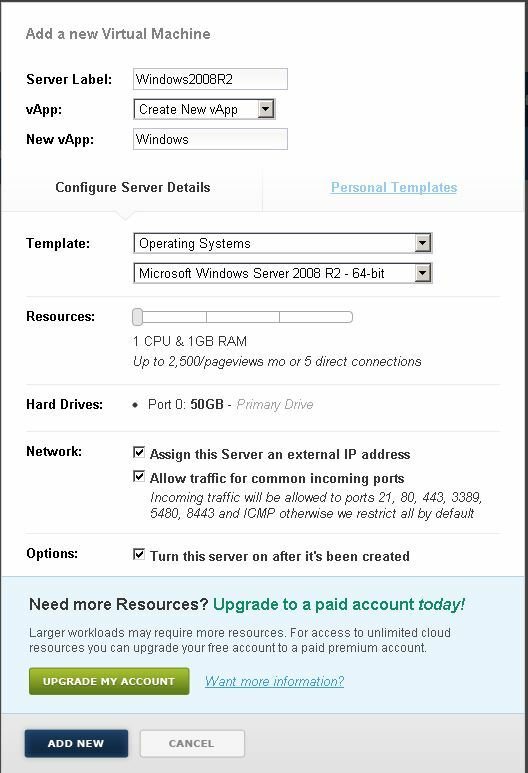 Also, you should have IP Addresses listed, assigned to you depending on your selections. You can use the same process to create any of the machines listed in the OS menu or even build application machines. Now you can click on the screen shown and “Run Console”, which should display the console screen, after installing a plug-in and allowing a pop-up in your browser if required. 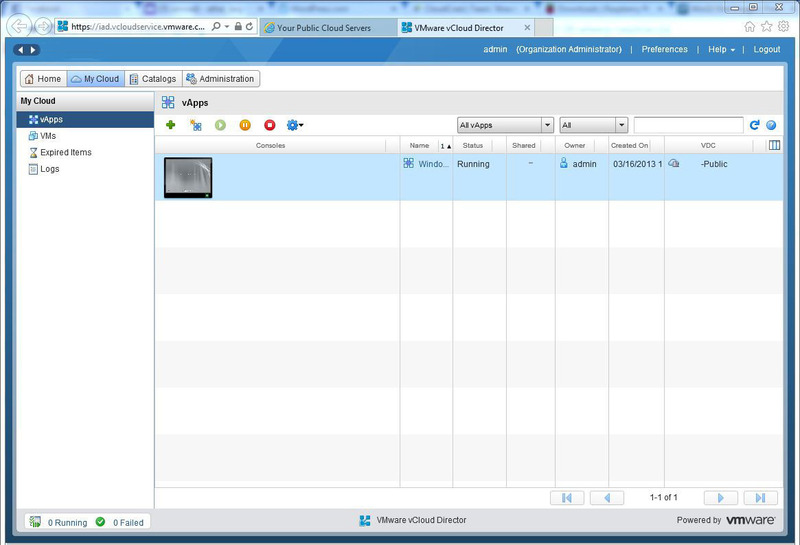 You could also click on “View in vCloud Director” to open a new tab where a proper vCloud Director style window will open and present you will all the familiar options. This is where Chrome users will feel disappointed as the option doesn’t work with it. 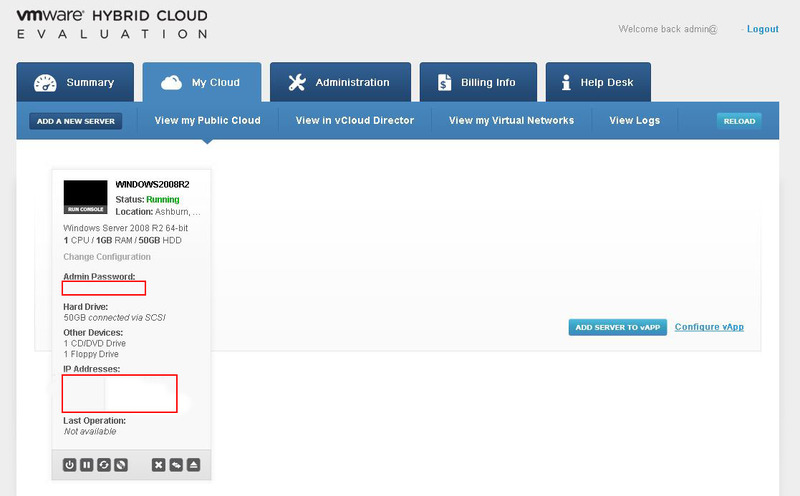 That said, you don’t have to use vCloud Director and you can interact with the machine while remaining in the “View my Public Cloud” screen. The machine needs to be powered-on to connect ISO etc. and if the plug-in is installed, the console will also run fine. Please note: If your browser has just been upgraded by Microsoft to Internet Explorer 10 recently, then the console will still throw up a warning but click on “Continue Anyway” and it works (correct at the time of writing 16/03/2013 12:15 GMT). The red boxes mark the areas where you’ll have IP addresses assigned to your machine. As you can see, you can control what talks to the machine you’ve just created. Click on the link “Upload New Media”. I won’t repeat what is mentioned there as it’s a well-documented process and does exactly what it says on the tin! Essentially, an MSI package gets installed and once done, you can upload your own media and templates to use as you please. Remember: It’s your responsibility to ensure that all licensing requirements are in place for the media you upload and use. This is nothing to worry about. The process tries to apply a customization process to the machine but with no OS present, it doesn’t make sense. VMware will probably fix this later. Click “OK” to continue but I would strongly suggest editing the machine’s configuration (in vCloud Director) to untick “Enable Guest customization” as having it enabled, might interfere with booting up of the machine later. At this point, you may find that your newly created machine disappears from the list. If that happens, click “Reload” on the right-hand side on the menu bar above and the machine should return to the list. Now the eagle-eyed reader will have noticed by now that I am trying to create an ESXi server in the cloud. Granted, this might not have much use up there but it would have been quite simple to create any Windows or Linux machine and I needed a challenge :-). Note that the machine gets created as a “CentOS 4/5/6 64-bit)” machine and as ESXi requires 2 CPUs and 2 GB RAM, that will allow just one machine for me. 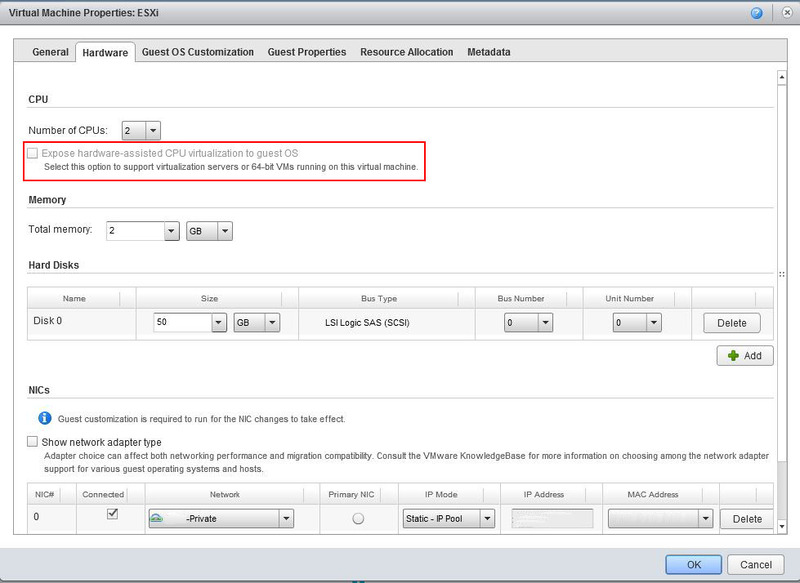 Power-on the machine, attach the ESXi ISO and you will probably need to reboot the machine to boot from that ISO. 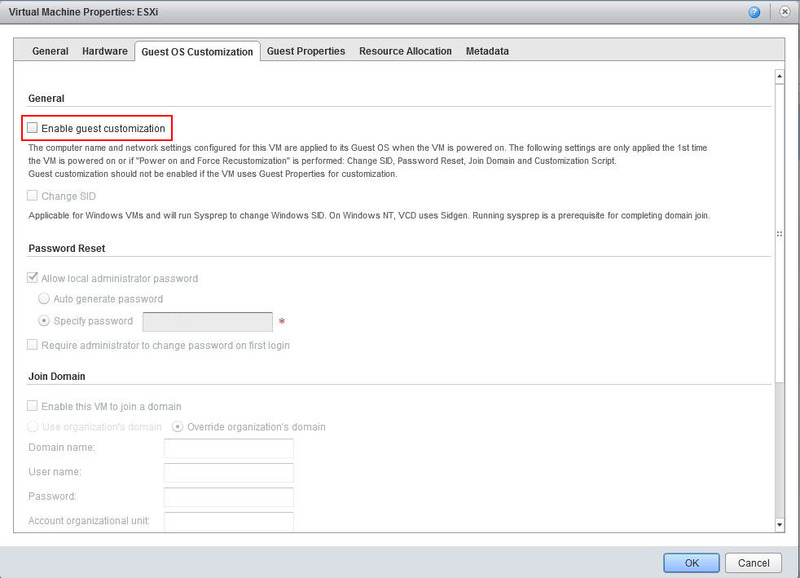 Alternatively, you can fire up vCloud Director with either Firefox or IE and attach the ISO before booting up the machine. 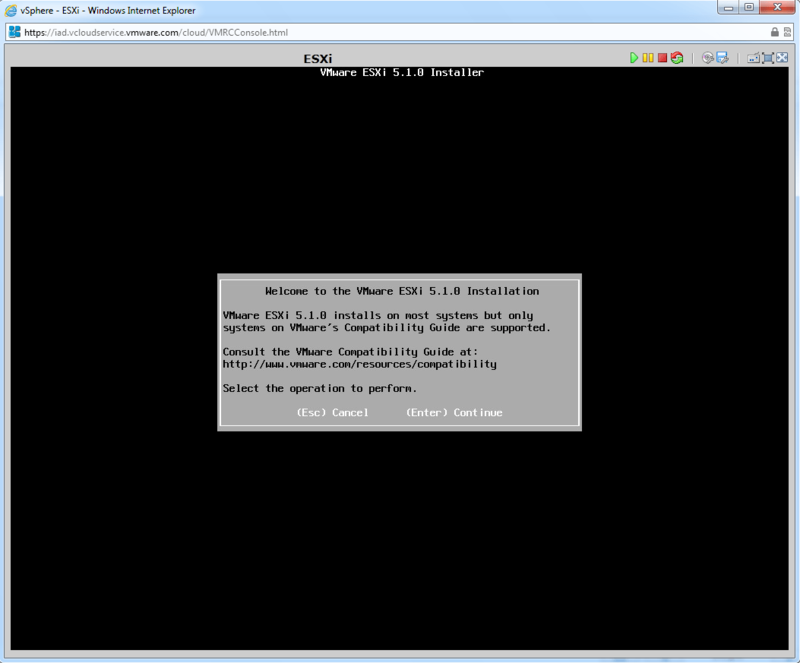 Either way, the machine successfully boots up and arrives at the ESX Installer welcome screen. Rest of the process follows as normal. The only thing to report is the issue with Hardware Virtualization not being enabled but hey, this was just a test to prove a point. 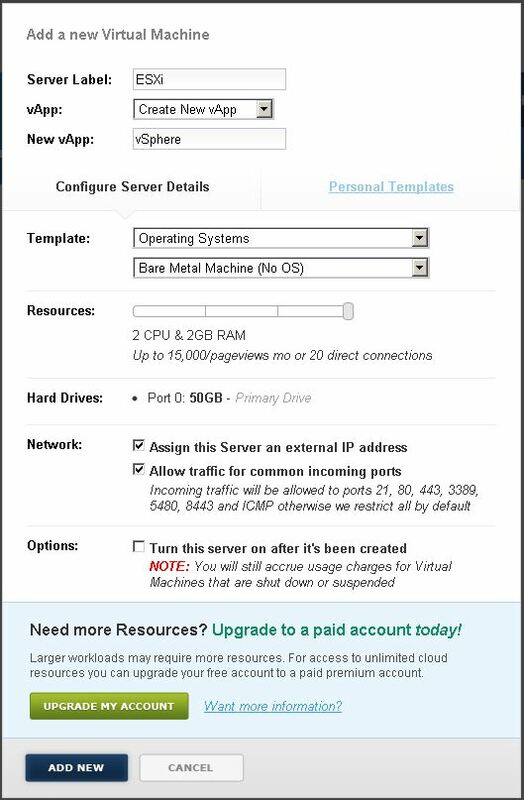 I tried ticking the box that is available in the “Hardware” tab (while editing the machine in vCloud Director) but it can’t be ticked on my set up as either the underlying architecture either doesn’t allow it or the free version doesn’t.